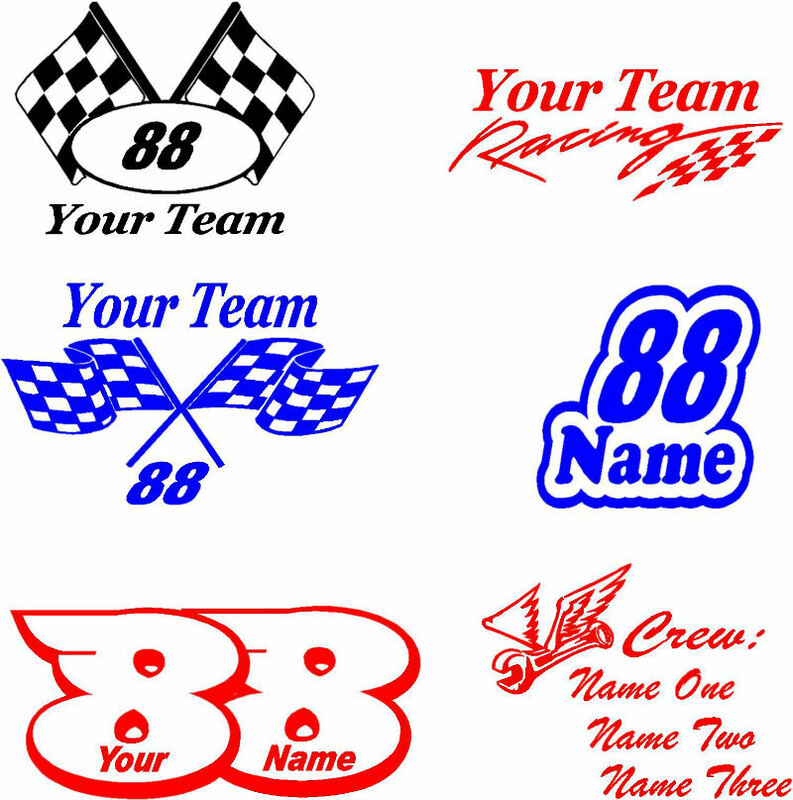 This page includes information and pricing on race car lettering, as well as installation instructions, and a few samples. Below you'll find our most common race car lettering packages. Of course, extra sponsors or custom graphics can be added to any package at additional cost. Feel free to contact us for a quote for your exact needs. Discounts will be applied to teams sponsored by Wengerd Enterprises. Custom graphic design and installation is also available. On all orders, a sample sheet showing all decals as designed will be provided for your approval before any cutting work begins. This sample design service is free unless custom logo/graphic design is required. All approved design work will be kept on file for quick and easy replacement at a later time if needed. This saves us time and saves you money! *Design of custom graphics/logos is not included in these package prices. *Special colors are defined as Holographic Prizm, Fluorescent and Mirror. *Standard colors are defined as the basic colors of vinyl such as solid colors. Below are some prices on individual decals that may be needed throughout the season. Discounts will be applied if these decals are used to replace any item in a previously purchased package since your design will already be on file. 1 Standard Color up to 7"- $3.00 each. Applying your custom vinyl lettering or graphic is easy enough to do yourself, although an extra set of hands is often very helpful. If you have any questions about application procedures, feel free to contact us before getting started. The following tools are recommended when applying vinyl lettering or decals. To help you get your decals positioned correctly the first time, it's best to do your layout and measuring before removing the backing paper. Simply place the decal where you want it, measuring and leveling it, then hold it in place with a couple of pieces of masking tape along the top edges. Always measure off of the vinyl, not the backing paper! Once you're certain that the decal is where you want it, use your razor blade to cut the tape along the edge of the decal to remove the decal. Now you can use your tape sections to align the decal once the backing is removed. If you plan to apply the decal dry, you can run a strip of masking tape over the decal from top to bottom, and use this tape line as a "hinge" by removing one side of the backing and applying one half of the decal at a time. Do not excessively stretch vinyl during the application. This is the main cause of end lift. Pull the vinyl only as tight as necessary to keep a straight line. Because vinyl is a pressure-sensitive product, a squeegee should be used for all installations. The purpose of using a squeegee is to remove the excess fluid and or air from behind the vinyl. You should always start the squeegee from the middle and either use a straight up or down motion. Allow the vinyl to set for 5 to 15 minutes. When removing the application tape, always pull it slowly, back onto itself, at a 180-degree angle. Bubbles should be punctured using a pin. Do not slit the vinyl to release the air. If the vinyl is slit it will spread or gap. The cutting or trimming of any stripe or graphic should be done using a very sharp knife and very little pressure. A heat gun or hair dryer can help you fit the vinyl over non-flat surfaces. Here's just a few samples showing some team decals, hero decals, and crew decals that we offer. We can also customize any design to fit your needs.